The new issue is of Britain’s best-selling outdoors mag is dedicated to the crown jewels of walking – the highest peaks in Wales, Scotland, England, Ireland… and Yorkshire. Out Thursday 25 April. It’s full of inspiring stories and advice, wonderful walks, and a free 32-page guide to the best new boots and walking shoes, and how to care for your feet whatever size, shape or quirk. It’s also bursting with #walk1000miles stories, competitions and five new mini-challenges giving you the chance to win a money-can’t-buy golden #walk1000miles badge. Find out why it’s the UK’s best-selling AND fastest-growing walking magazine, three years in a row! Free 32 extra pages of boot reviews, footcare advice and special fitment features. Don’t buy boots without it! Best-selling author of The Salt Path Raynor Winn interviewed: how are they both now? 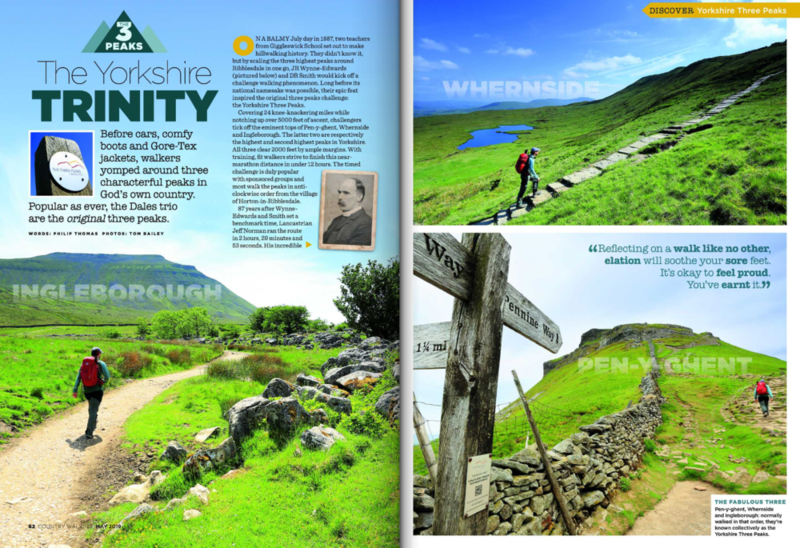 The original Three Peaks – and however you do it, a marvellous trio of peaks in God’s own country! The launch of our new challenge! Doing anything incredible this summer?